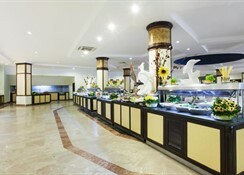 Larissa Stone Palace Hotel is a plush and welcoming hotel sprawling on an area of 32,000 meters. It is very close to the sandy beach and has many tourist attractions nearby. Larissa Stone Palace comprises of 7 buildings and lush green gardens. It has an impressive outdoor pool surrounded by tall date trees giving the feel of a very Mediterranean atmosphere. As many as 386 well-appointed rooms with free Wi-Fi, flat-screen TVs and en-suite bathrooms invite the guests to relax in ultimate comfort. There are plenty of sporting and entertainment activities at Larissa Stone Palace Hotel. A private beach area with a snack bar is thronged with tourists in the evenings. The resort offers all-inclusive packages for the tourists. Larissa Stone Palace Hotel is just 250 meters away from the sandy private beach. It is 9 km away from the stunning Manavgat Waterfall and just 1 km away from the Antik Tiyatro which is a classical theatre. The resort is 10 km away from plenty of historical attractions in Side. Larissa Stone Palace Hotel oggers 386 rooms distributed in 7 buildings. The rooms are elegant and understated. One can find free Wi-Fi, flat-screen TVs and en-suite bathrooms here. The flat-screen TVs come with satellite connectivity. There are minibars and balconies in the rooms too. The minibars are well-stocked and help you satisfy your in-between meals hunger pangs. They are at an extra charge. The rooms come in the types of Standard and Family Rooms (two types). 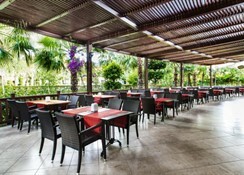 All-inclusive packages offering breakfast, lunch and dinner and drinks are available at Larissa Stone Palace Hotel. 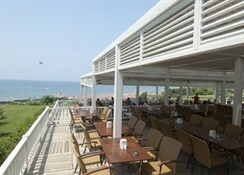 One can sample various dishes such as Turkish and international cuisines. The food here is delicious and prepared by master chefs from different parts of the world. 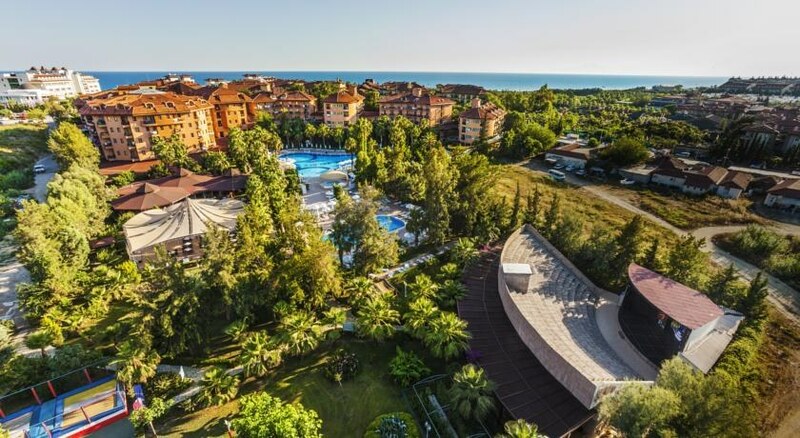 Larissa Stone Palace Hotel arranges for live entertainment and children’s activities in the evenings. The resort also has indoor and outdoor pools, a relaxation pool and a kid’s pool with waterslides. Guests can play some tennis, beach volleyball and water gymnastics. Guests can also avail a sauna and a Turkish bath. They provide animation, amphitheater, massages, skin care, darts, billiards and some dance shows for entertainment. The hotel location is very good for the beach, the beach bar is very good. We really enjoyed our stay there, the hotel staff were very friendly, and polite. Our room was very nice, and kept as it should be by the maids. The restaurant was every bit as good as could be expected, spotlessly clean, with nice presentation.